Hamels strikes out 10 in his 14th win of the year. Not quite a complete game shutout, but Cole Hamels still dominated in the Phillies 4-3 victory over the Milwaukee Brewers. Their win today puts them in position to split series tomorrow. -Aramis Ramirez led off the second inning with a home run. In the same inning, the Brewers would get a runner in scoring position with one out. Hamels was able to escape the jam with a little help from a baserunning mistake and the defense. Hamels settled down and would remain in cruise control until the eighth inning. -Cole Hamels finished the night after 7.2 innings. He allowed three runs on eight hits and a walk. His changeup was filthy, as he struck out ten in his 14th win. 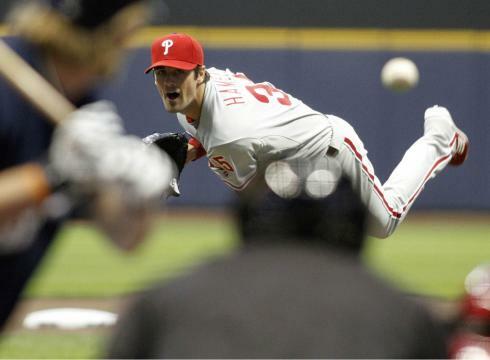 -For the twentieth time in his career, Hamels reached double digits in strikeouts. -Hamels’ earned run average remains under three for the year, currently standing at 2.94. He continues to be the Phillies’ best pitcher this season. If there is any bright side to this 2012 season, it’s Cole Hamels. -John Mayberry Jr. put the Phillies on the board in the second inning with a two-run home run to left field. To follow Mayberry, Eric Kratz hit a home run of his own. The back-to-back homers were nearly hit in the same spot, only the bomb Kratz hit was hit a little higher and further. -The Phillies got their fourth run thanks to a Ryan Howard RBI double in the third inning. -Hamels was able to get two quick outs in the eighth inning, but Jonathan Lucroy kept the inning alive with a single. That single turned out to be significant, because Ryan Braun followed with a home run to right field, making it a 4-3 game. -Braun has killed the Phillies throughout this series, as tonight’s homer was his third of the series. Braun is currently 6-for-11 with 6 RBI during this series. He is 13-for-23 (.565) with 6 HR against the Phillies in 2012. -After Hamels gave up the home run to Braun, Charlie Manuel decided to bring in Papelbon for the four-out save. Papelbon easily got out of the eighth inning. -Papelbon had a quick 1-2-3 ninth inning. He struck out three over an inning and a third to secure the save. Papelbon looked pretty nasty in the last inning, hitting 95+ on the gun.